BATTLE CREEK – The Holton football team’s Cinderella run through the Division 8 state playoffs is finally over, and so is Jack Nummerdor’s five-year career as the team’s head coach. 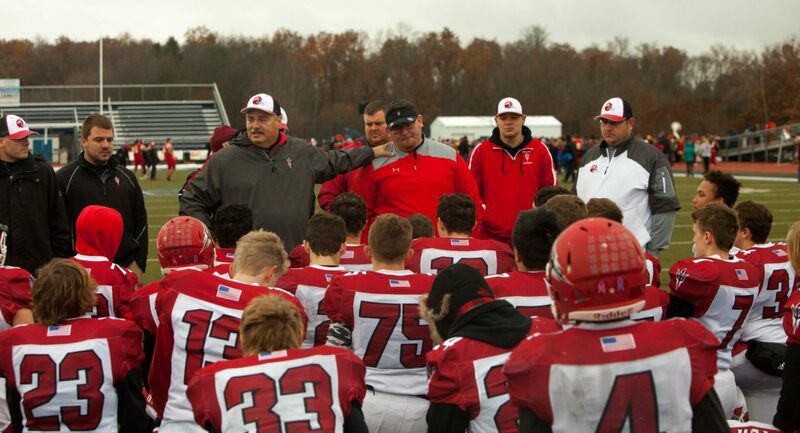 The exciting ride came to an end with a 38-0 loss to the powerful Reading Rangers in the Division 8 state semifinals on Saturday at Battle Creek Harper Creek High School. But when it was all over, Nummerdor walked away with the best season of his coaching career, and the players had the satisfaction of knowing they went further than any Holton squad has ever gone before. Holton finished the season with an 8-5 record, which included three impressive victories in the playoffs, a district championship and a regional championship. After the game, an emotional Nummerdor told the players gathered in an end zone how much he loves them and how proud they made him. The Red Devils started the season 5-1, lost three in a row, snuck into the playoffs with a 5-4 record, then stunned everyone by beating Martin, Decatur and Mendon in the postseaon. “The best thing about this is to be able to go out with the kids I did,” said Nummerdor, who became the assistant principal and athletic director at Mona Shores Middle School in October, but finished the sesaon with his Red Devil squad. Holton senior running back Derek Pouch said he and his teammates were happy with the success they made out of their roller-coaster season. Pouch said it was also nice to send Nummerdor off as a district and regional champion coach. “I feel like he deserved it,” he said. The Red Devils lost to an outstanding Reading squad that dominated the line of scrimmage on both sides of the ball and the time of possession. The Rangers wore Holton down with a punishing ground game that features three or four talented running backs, and a stifling defense that found its way into the Red Devil backfield all afternoon. Reading took the opening kickoff 65 yards in 10 plays to take the lead. Holton had a chance for an early stop when the Rangers faced a fourth-and 2 at the Red Devil 10, but Reading’s Hunter Midtgard ran it into the end zone. A two-point conversion put the Rangers up 8-0. Reading scored again on its second possession, going 53 yards on 11 plays, and ending the drive with a two-yard TD run by Anthony Willoughby. Another two-point conversion made the score 16-0 with 18 seconds left in the first quarter. The Rangers got their third touchdown with 43 seconds left in the first half when Midtgard scored from six yards out. Holton had a chance to stop that drive as well, when Reading faced a fourth-and-2 at the Red Devil 31, but the Rangers coverted, got the touchdown and another two-point coversion, and led 24-0 at halftime. The third quarter was scoreless. Reading’s Elijah Strine scored from five yards out early in the fourth quarter, and yet another conversion made the score 32-0. The Rangers capped off the scoring with an 82-yard touchdown burst by Ethan Lopresto late in the game. Lopresto, Reading’s top running back, finished with an unofficial 214 yards on 24 carries. Holton had several opportunities to get on the scoreboard. The Red Devils drove to the Reading 22 early in the second quarter, after a 35-yard pass from quarterback Drew Trygstad to Cameron Edgerton, but the drive ended when Trygstad was sacked on fourth down. Holton got the ball at the Reading 33 shortly before halftime, when Ricky Enders had a long kickoff return, but the drive stalled on fourth down at the Ranger 36 when Trygstad was sacked again. The Red Devils got the ball to the Reading 31 in the third quarter following a fumble recovery, but a fourth-down pass fell incomplete. Despite facing constant pressure from Reading’s pass rush, Trygstad completed five passes for 79 yards.